Fresh Bread, Spreads, Yoghurts and Bacon always included! Lime in the Coconut…. sweet and sour & delicious! Kaiserschmarren…… the Austrian Emperor´s favorite Dessert! Kids loved it, I asked Carl what he liked the most and he said Sailing, Caroline’s answer was the blue water and the food 珞 they both enjoyed the scuba experience. I will send some pictures that I took with my phone in the next email! The menu was perfect. More than expected. Healthy, tasty and something for everyone. Even the vegetarian in the family. Christine did a fantastic job also taken into consideration the somewhat limited space available for her. Bastiaan was a great barbecue expert. We loved the food, including the afternoon snack. We were also impressed by all the nice wine and Christine’s great cocktail and long drinks. The water was amazing, the islands we visited were exciting, and we loved visiting the different islands with different activities. Fantastic and beautiful. Simply perfect. The pace was a great fit for us, relaxing but at the same we visited a lot of exciting places. No stress, only enjoying the scenery and places we visited. 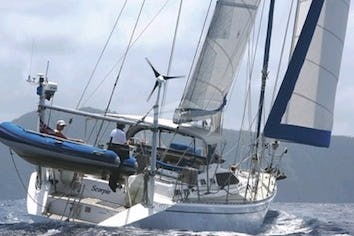 Sailing distances each day was just perfect, not too long and gave us the opportunity to both enjoy and relax. We really enjoyed the Scuba dive opportunities and the great experience Bastiaan gave us through teaching and diving together with us. It’s great that all equipment already were onboard the boat, made it very convenient and easy to enjoy Scuba diving, snorkeling, water skiing, kayaking, paddleboards and the opportunity to easily access the different islands by the dingy. We hope your charter was everything that youexpected. We would love to know some of your impressions about your yachting holiday. It would aid us in future bookings if you could answer the following questions and provide any additional comments you might have. Answer*: It was an amazing experience. No pressure, no worries, just spontaneous fun. Agenda was flexible and everyday was a newadventure. Over all just a great experience. Answer*: Couldn’t ask for a better crew. Bastiaan and Christina made the experienceperfect. Very interactive, fun and apleasure to be around. If you are diving and get a foot cramp Bastiaan gives the most amazing foot massages underwater……Thanks Bastiaan! Answer*: No problems, well organized and the crew kept everything tidy. Weather was excellent and cabinswere fresh, clean and well ventilated. Answer*: Yes, however I skipped out and slept through the training, would not advise it. But once I learned how to flush the toilet it was all good. They are very knowledgeable and extremely helpful in explaining the workings of the Yacht and extremely informative about sailing and let us interact and help out as much or as little as we wanted. Great experience! • Couldyou describe the quality of the cuisine? Did the menu meet your needs and expectations? Answer*: The food was 5 Star amazing! Every meal exceeded our expectations. Sooo good…..
Answer*: They have perfected the areas to visit and have many options to change up on the fly to accommodate whatever you are up for during your adventure. Amazing! Answer*: The pace was perfect. There was never any stress just leisure and fun every day. If you want to do something they accommodate if you want them to decide they pay attention to your likes and decide, zero worries. Answer*: If you want a fun and relaxing vacation with amazing views, warm weather and water, great snorkeling & diving and amazing food, adventure and an excellent crew sail with Mimbaw, you won’t be disappointed. A very sincere thank you for a wonderful experience last week. We all had such a relaxing, enjoyable time. Each one of us felt you really paid attention to our preference list and that's challenging with 6 guests! From the morning coffee delivered to us each morning on the Mimbaw trampoline, to your patient diving instructions, to the special Birthday celebrations, and exceptional dinners, it is so apparent you both genuinely cared about every detail. We absolutely loved our vacation and we all miss not just the escape from work & responsibility on the beautiful Mimbaw, but the new friendship we made with you both! We hope your next charter is going well, and we wish you both smooth sailing and beautiful sunsets! We travelled on May 3-10, 2014 with our two college age kids on the Catamaran Mimbaw. Capitan Bastiaan and Chef Jenny were the perfect crew for our family vacation…..Very professional and knowledgeable. The boat was fabulous, very clean and organized! It had all the toys needed for fun everyday! Paddle boards, snorkels and masks, fishing and scuba gear. Our kids wanted to learn how to scuba and Bastiaan was a perfect teacher! The rooms/bathrooms were perfect in size and very clean. Every room had several fans that worked great to pull in the summer breeze off the water. No A/C needed. We did as much or as little as you wanted too. Naps every afternoon on the trampoline were wonderful. The food was delicious! Chef Jenny cooked amazing meals and snacks. Beautiful tables were set for every meal. And yummy drinks were served for happy hour every evening to watch the sunset! We couldn’t pick a favorite spot. All the places we stopped were unique and fun! But the kids would say learning how to scuba was a highlight to the trip! We had a wonderful and unforgettable time with Bastiaan and Jenny and will definitely do again. We would recommend to anyone! 6. Could we at have helped you further in any way? overall, food good and presented nicely. marie, the cook, who is lovely and wonderful, was sea sick for 3-4 days which likely hindered her effectiveness. two meals were overcooked and inedible. captain bastiaan is skilled, energetic, thoroughly knowledgeable with his boat and the bvi, and instills confidence that he can get through any situation. additionally, captain bastiaan wants to please, is extremely personable, naturally entertaining, very bright, worldly, logical, and fun to talk with on a vast array of subjects. 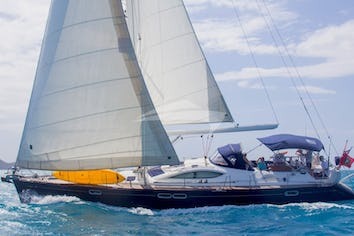 i might suggest that virgin island sailing call the client just prior to leaving home on the trip with up to date information as to where and how to meet up with the boat. the bvi is a special place to visit especially sailing. highly recommended! good job! The Best! It was the very best out of the 7 sailing trips we have taken. Better then a 5 Star hotel! Is excellent good? The food was off the charts. We picked where we wanted to go and away we went. They showed us the islands like never before. From start to finished your team was excellent. Wonderful service and love it when a plan comes together. We loved our vacation, we think it was the best vacation ever. Captain Bastiaan and Jenny were both awesome! Bastiaan seemed very knowledgeable about the area and sailing in general. They were both extremely friendly and attentive. I have only glowing positive reports on both. 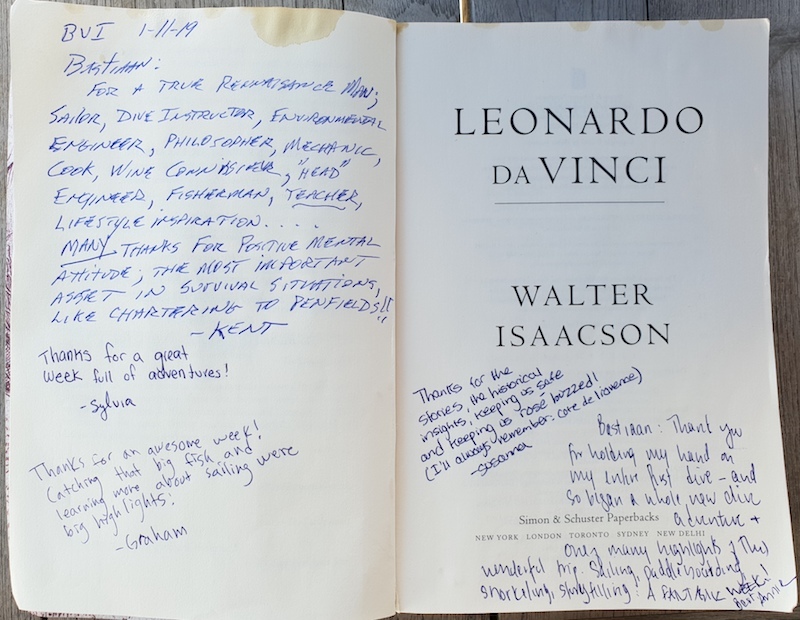 Bastiaan was fun, engaging, intuitive, knowledgeable, interesting and full of life. Jenny was courteous, helpful also interesting, a great cook ,knowledgeable and friendly. The meals were great! Breakfast was served with cereal, yogurt, fruit, then came the eggs, bacon. We were also served pancakes and locks with bagels...Dinner was great every night, they paid attention to our preferences. Mimbaw was very clean, the cockpit was comfortable and always had enough shade. They made sure of it with a cover over the trampoline. We enjoyed Bastiaan’s stories and enthusiasm, Jenny’s food and cooking mined in with a sweet personality. We found our time very relaxing. The diving was a lot of fun, the only thing that could of made it better would be if the medical forms were emailed to us earlier, before we arrived on the boat. Bastiaan did a great job while we were in the water. We would charter this yacht and crew again anywhere in the world!!! We had an absolutely splendid time. I do not know when my mother was more relaxed. My girlfriend, Judy, even though she had some sea sickness still had a great time. It truly was a pleasure getting to know Bastiaan and Jenny, two very inspiring people. Again, honestly it was the best vacation of my life, so far! Jennie, the first mate, did a great job of preparing food. She also was really into plating and really catering to our group. I would recommend perhaps more bbq - we had hamburgers one day and Jennie grilled them to perfection. That would be my only comment - more grill! Jennie and Bastiaan both made amazing drinks - bloody mary’s, pina coladas, frozen mojitos, you name it. It was great. They were very proud of their work - Bastiaan with his toys and adventures and surprises and Jennie with her beautiful food and plating. They definitely went above and beyond. They were so competent on the sea. We felt very safe and always like we were in good hands. Honestly, I feel that Bastiaan is very professional and is an amazing host. He will take you out all night long if you wanted or he will set up a romantic private dinner on the beach for you. He will cater to whatever type of vacation you want. It sounded like they do a bit of everything and they are so relaxed and laid back that they can cater. Were the sailing area and conditions suitable for this yacht? been too much for everyone. We stopped at 14 different places and it was great to be able to jump around to a lot of little islands, bars, and snorkel spots. Was this yacht a good fit for you and your crew? Bastiaan is AMAZING. His stories and life is so interesting and we really got a long. He seemed like he was born to do sailing and yacht charters. We are an internationally minded group so we just loved Bastiaan and his background. We also loved Jennie’s Aussie spirit. They were just a PERFECT fit for us. What did you like best about your charter? Hands down - the crew. Bastiaan was so funny, warm, and welcoming - such an interesting character with an interesting history. He was so laid back about his boat, his toys, and we really felt like home. Jennie was also fantastic. They were great hosts and had fun friends. Their other friends worked super yachts and took us on some amazing boat tours. Now we want to go yachting - ha! The food and drink and service was fantastic. Honestly we were a bit nervous since we are all foodies and cocktail fans from New York. We forgot our cocktail set and Bastiaan had everything we needed! It was impressive. Jennie cooked fabulous meals too. What did you like least about your charter? Honestly - there was nothing that I liked least - maybe the occasional cloudy weather, the harsh reality of grey New York post charter, etc. 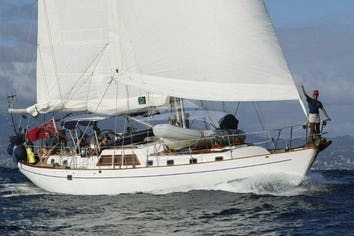 Would you charter this yacht again and/or recommend it to others? I would definitely charter this yacht again for Bastiaan, Jennie, and all their amazing toys. It was so fun and we have joked about doing my bachelorette party on the boat. This is the second time we've chartered a boat, first time with Captain Bastian and First Mate Darren. We had a fantastic time- the crew was very accomodating, friendly and fun! We will definitely come again and rebook with Mimbaw and Captain Bastian. Thanks for such a great time!